AkelPad is a plain text editor focused on speed and a small size. The program includes unicode support, available single-document and tabbed interfaces, unlimited file size, and multi-level undo, etc. Alternatively, AkelPad Portable portablizes recent files and search history and has both the 32- and 64-bit versions together and chooses the right one. X-AkelPad is also available. Stealth: ? Yes. If you set Recent Files and Search History to 0 as these are stored in the registry. Flag 128 in the manual parameter "PaintOptions" - unit of vertical scrolling is line (default is pixel). 1 - force to use last directory. Revised main entry "How to extract" instructions to reflect above findings. AkelPad will stubbornly create umpteens "HKCU\Software\Akelsoft\AkelPad\Options"
registry entries on 1st run, whether or not the "Save settings to INI file" option is initially selected. 1. Unzip AkelPad-4.8.5-bin-eng.zip in directory of choice. 5. Run happily ever after. Tried AkelPad, very small and with plugin make it become the best Notepad software ever! Problem is it is not save Recent Files to ini file or something like, it save Recent Files to registry, hope developer will add a option to save recent files on ini file in the future, this will make AkelPad perfect! I suppose every user of this great text editor already know about that, but it is noteworthy that Akelpad supports 19 languages apart from english. Just download the installer and extract your preferred one to AkelFiles>Langs folder. There is a lot of room for improvements though. Any understandable instructions for installing the spell check (portable!)? Although very nice editor for single window mode. i can't find on AP forums or elsewhere how to edit or create syntax file (*.coder file). I see some clues in reading simple parts of a coder file, but i can't yet "inscrute" the critical portions that have strings of commas and double quotes. wish there was way to save newest download plugins when using akelupdater. this would allow one d/l and manually 'sync' ap installs on other pcs. 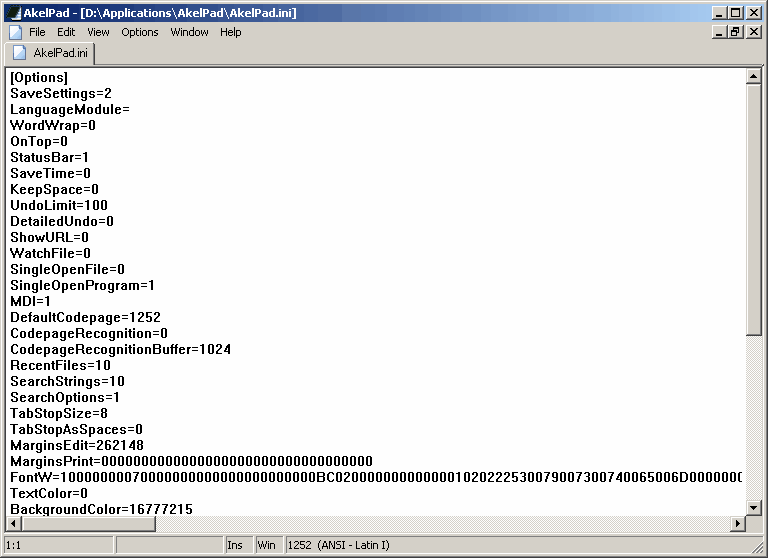 btw err pop says akelupdater.exe must run from main akelpad.exe install folder. plugin settings dialog tedious in not showing which plugins will run constantly, except by err response for plugs that will not. must restart ap for plug seetings to "take". i compare to crimson editor, my main TE (never portable or easily portablized, AFAIK). overall, i like AP for the syntax formatting, but the older version seemed less "beta". prev version of ap (4.2?) would recall last open docs when starting up. this current 4.4.8 won't recall, and none of the settings hint at dis/enabling last-open recollection. save or saveall command [clicking floppy button] causes scroll position to jump. I think position jumps less when you are near bottom of file. after a saveall, button doesn't switch to grey status as the save button does. the "show invisible chars" tab char is the euro double arrowhead "quote" char. it doesn't occupy enough horizontal blankspace. Tab char seems almost narrower than the blankspace char. And seems settings cannot separately disable tab char. case change should be context menu, imo. Giorgio Bordignon: uncheck "Menu\View\Always on top"
Does anyone overlap akelpad ? It's always on top ! no frame can hide it ! Akel Pad is outstanding -- my default text editor. Multi-file capable, yet efficiently small. Looks like Akelpad has code folding now! Going to check it out. FYI: tabs don't show up unless you enable options|window mode|multi window(MDI). eluded me for awhile. One of the very, very best replacements for notepad. Been using it for many years (hard to keep up with its very frequent updating!). Writing this to point Akelpad can do column selection. Utter gem of a program. Tiny size, fully portable, lightly fast search and replace, elegant interface, many extras via plugins. Did I mention Akelpad does column selection (alt+leftclick, same as Word)? I love this one. Very basic and fast, great for my note taking activities. I downloaded the classic english version: only 18KB. I can't paste Thai Text from Notepad to graphic applications before. Now, I can do it. I think Akelpad good more Notepad. It's lite and compatible with Saru Revowel 2 to edit Thai Language Text to paste to Adobe Applications. Syntax highlighting is vastly improved! Although they could tweak the colors and font styles, it's much better. Try the new version and and the new highlight plugin. Two opposable thumbs up here too. Good balance of speed+clutter vs. features. I use another editor for developing code, but this is my default plain-text editor. Just a small nit ... Registry entries are created on first run of the program, -before- you have a chance to change the options. You have to manually delete the HKEY_CURRENT_USER\Software\Akelsoft key. After the options are set as described here, the key won't be recreated. An excellent and well configurable text editor. Some of the plugins are very useful extensions, such as Toolbar, ContextMenu, Lineboard, Lines, Autocomplete and others. See the Akelpad forums for tips and trics, some too advanced for me. I miss one feature which would make it the perfect editor for me: spell checker, for instance a plugin for ASpell (Notepad++ has one). this is my default text editor as well. The tab really manage clutter on task bar. My default text editor too. No problems with Asian languages. a rather interesting feature is "Support of any code page installed in the system". problems with showing chinese or japanese letters. only a mess. i've changed the codepages and restarted the prog. nothing helped. this would be the best notepad replacement if there was a better syntax highlighting plugin (such as the ability to properly display html, php commenting)! other than that, it is the smallest, most powerful text editor available. I use this program extensively and enjoy it. I like how it has a preview window when opening a file. Multiple files with tabs. Can't beat it. Small too. I like the feature of a special character that I use many times, but when I open the document again, all special character become the "?" symbol. How can I fix this? The only one I can see is the time and date function. There are plugins available for this too on the website. It even doesn't have all the features of windows native notepad. I better find something with native notepad features + other features. I keep akelpad, AM-notebook, and mempad all on my usb key for notestuff. Have been using them for about 3 months now. I use mempad about 90% of the time now. Check it out as well. I agree this is the perfect solution I was looking for... a lean and fast portable replacement for Notepad but with features that provide improved usability and usefulness. This one is just right. Not too many features, not bloated, works for what I need it to do. Really nice little app, ideal for my uses. Full-screen and other plug-ins available at homepage.